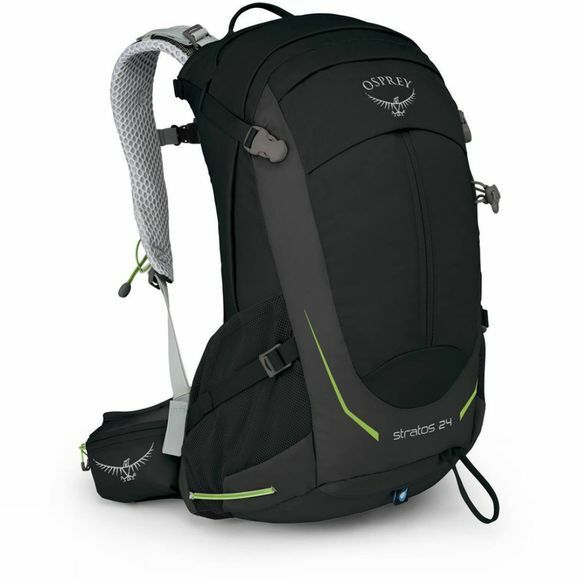 Part of Osprey's new collection for 2017, the Stratos 24 is perfect for those looking for a ventilated day pack with enough space for extra layers, food, water and equipment for hikes in changeable weather. The fully adjustable AirSpeed™ ventilated back system with breathable suspended mesh provides comfort in warmer climates, even when the pack is full. A durable, detachable raincover helps to keep the contents of the pack dry should the weather take a turn for the worse. Stratos 24 is equipped with a large panel opening, an easy access pocket on the top and a large, vertically zipped expansion pocket on the front which is ideal for storing a jacket or spare layer. The Stratos 24 is compatible with all Hydraulics™ and Hydraulics LT™ reservoirs, so you won't need to keep stopping to rehydrate. The Stratos 24L by Osprey features an impressive AirSpeed™ trampoline mesh style back system for comfortable ventilation during long journeys, plus an integrated raincover to protect you and your gear from rain. Other features include a trekking pole attachment, removing sleeping pad straps, internal hydration sleeve, side compression straps and more, for all types of activities and treks.